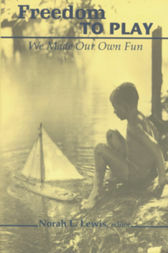 “When we were children we made our own fun” is a frequent comment from those who were children in pre-television times. But what games, activities and amusements did children enjoy prior to the mid-1950s? Recollections of older Canadians, selections from writings by Canadian authors and letters written to the children’s pages of agricultural publications indicate that for most children play was then, as now, an essential part of childhood. Through play, youngsters developed the physical, mental and emotional skills that helped them cope with life and taught them to get along with other children. In both rural and urban settings, children were generally free to explore their environment. They were sent outdoors to play by both parents and teachers. Their games were generally self-organized and physically active, with domestic animals acting as important companions and playmates. Children frequently made their own toys and equipment, and, since playing rather than winning was important, most children were included in games. Special days, holidays and organizations for children and youth provided welcome breaks from daily routines. Their lives were busy, but there was always time for play, always time for fun. Norah Lewis has provided an entertaining view of the toys, games and activities in Canada and pre-confederate Newfoundland from approximately 1900 through 1955. Her book will be of interest to historians, educators and sociologists, as well as anyone who lived through, or wants to know more about,those early years in Canada, and the games children used to play.